The South African branch of the International Christian Embassy Jerusalem (ICEJ) has called on Christians in SA to sign and share its petition to reinstate the ambassador to Israel, where SA’s embassy in Tel Aviv has been downgraded to a liaison office. SA International Relations Minister Lindiwe Sisulu last week confirmed the move by the government in line with a resolution by the ruling ANC party at its national congress 16 months ago in support of “the oppressed people of Palestine” and the recall of the ambassador last May in protest against the killing of Palestinians during unrest on the Gaza border. “It is with deep regret that we have taken note of the decision by Lindiwe Sisulu, our Minister of International Relations and Cooperation, to not replace the SA Ambassador,” said Vivienne Myburgh, national director of the SA branch of the ICEJ in a press statement released on Sunday. She said the ANC policy decision to downgrade relations with Israel “was strongly influenced by individuals who have continued to spread malicious misinformation regarding the State of Israel and have found a fertile ground within elements of the ANC due to the perceived common struggle with the Palestinians against ‘their oppressors’. The totally misconstrued ‘Apartheid’ charge against Israel has been the emotive ground used to impact the ANC government, who have ruled since 1994. In addition to launching a petition, the ICEJ SA plans to meet with relevant senior government officials, to convey to them that this decision does not represent the majority view of the 79% of SA, who consider themselves to be Christian. Referencing Genesis 12:3 which talks of consequences of cursing Israel, the ICEJ says on its petition page that by downgrading the embassy, the ANC and SA government are subjecting themselves to judgement and a curse from God. “We as Christians and Jews in South Africa (nearly 80% of the population) can stand together and appeal to the ANC and South African Government to reinstate the South African Ambassador in Israel and reverse the resolution to downgrade the embassy. “Make your voice heard by signing this petition by means of providing the following information (email, province & country),” urges the ICEJ. Addressing delegates at the South African Institute of International Affairs last Wednesday, Sisulu said the liaison office in Tel Aviv “will have no political mandate, no trade mandate, and no development cooperation mandate. It will not be responsible for trade and commercial activities”. 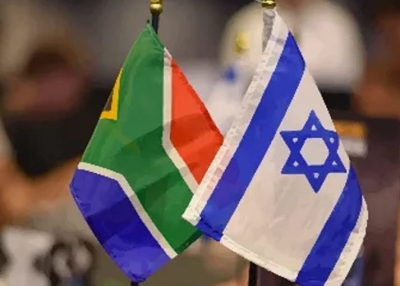 Middle East Finance and Business News report that Israel plans to respond to the SA diplomatic snub by pulling out its ambassador to South Africa and downgrading its embassy to a representative office which will deal with consulate issues. IOL News reports there has been broad support for the government’s decision to reduce its embassy to a liaison office, citing Cosatu, the SACP and the Palestine Solidarity Campaign as some of those in favour of the move. And in a statement released on Wednesday the IFP called the embassy downgrade “regressive diplomacy which does not advance the agenda of peace and stability in the Middle East” and called on the government to reconsider its position. In a Facebook post, Louise Swart, wife of ACDP MP Steve Swart, says: “As an ACDP supporter, I am calling on us all who are 80% believers in SA, to vote out the ANC for this decision to begin the downgrade of our Israeli EMBASSY. The SAJBD continues: “A downgrade would further be inconsistent with how South Africa has always conducted its foreign policy, which has been to engage with all sides and never to resort to the politics of boycott. “A boycott would also show South Africa to be completely out of step with what is actually happening on the ground. Increasingly, we are seeing more and more countries establishing diplomatic and other ties with Israel, not only in Africa, but even in the Middle East itself. Over the past week the leaders of two BRICS countries, Russia and Brazil, met with Prime Minister Netanyahu. “In reality, the ability of South Africa to influence the Middle East peace process is limited. Where our country can genuinely make a positive difference is by sharing its own story of a negotiated transition with Israelis and Palestinians, thereby helping them achieve a similar resolution. Were ties with Israel to be downgraded, however, South Africa would obviously only be sabotaging any prospect of playing any useful role in that process. Arthur Stark, chairman and Malcolm Hoenlein, executive vice chairman/CEO of the Conference of Presidents of Major American Jewish Organizations, said in a statement:“We have written to President Cyril Ramaphosa to protest the downgrading of the South African embassy in Israel. “Lessening diplomatic connections does not resolve problems and does not clarify any issues that may exist. For too long, South Africa’s government has joined the forces of rejectionism and extremism in their votes at the United Nations and in policies they have adopted towards Israel and the Middle East. It is most regrettable given the supportive role of the American and global Jewish community in seeking an end to the apartheid regime and supporting South Africa’s advancement,” they added. “There is much to be gained from a stronger mutual relationship between both countries and their peoples. Downgrading the embassy status curtails those possibilities at a time when many African countries are developing closer ties to Israel, opening embassies, and recognising the important benefits from growing bilateral relations. We urge the government of South Africa to immediately reverse its decision,” concluded Stark and Hoenlein. In an online article entitled ANC en route to head-on collision with God, Brother Marko of Countdown To Christ Ministries writes that economically-challenged South Africa needs Israel more than thriving and technologically-advanced Israel needs South Africa. He also says that biblically and historically, nations that are hostile to Israel become enemies of God. South Africans needs an ambassador in Israel, the Holy land for Christians! I stand by Isreal. I don’t agree with this new stand. I stand with Israel all the way. The SA government has long been an enemy of God by implementing various abominable laws – this stance against Israel comes as no surprise given the ungodly people in ANC leadership, ANC and SA Government is one and the same thing. I doubt that Ms Lindiwe Sisulu bothered to verify the facts on the ground in Israel. For all of our sakes in SA we will be praying for our government to reverse their uninformed decision. The ANC’s stance is beyond hypocritical given that it is happy to trade with and play sport against some of the most repressive regimes on earth. However, I wish Christians would desist from saying South Africa is cursed. That’s God’s prerogative. If sisulu read ,with many uninformed south Africa,SON OF HAMAS they will get a firsthand account of the real Palestine issue from the Hamas founders account. S.A leaders must stop in what their private capacity,we must really pray for our Country.